Hydroponics, while somewhat similar, is actually much different than aquaponics. The biggest difference, of which I’m sure you’re aware, is that there are no fish. In aquaponics, fish provide many necessary plant resources by pooping and participate in numerous biological processes including nitrification. Largely, the only grower input is fish feed and nutrient supplements. In a hydroponic system, the grower is responsible for providing all of the nutrients as a mixture in addition to supplementing. Therefore, you will need to understand the necessary inputs, what to monitor, and what not to do. The following is a list of guidelines rather than strict rules—every system is different based on type, grower, inputs, and crops. Keep that in mind as you use this handy dandy hydroponic reference guide! Look forward to downloading and printing this guide as a PDF for easy reference in your farm! and an NPK (nitrogen-phosphorus-potassium) mix. NPK mixes come in different formulas depending on the crop type. For example, there will be different mixes for lettuce, tomatoes, herbs, etc. Magnesium sulfate may be mixed with the NPK mix while diluting. Add both to the nutrient reservoir in the recommended quantities as indicated by the labels. Don’t forget that you must dilute to the correct ratio so if the bag says 1:100 gallons, and you only have 25 gallons in your reservoir, you’ll need to mix 0.25:25. Calcium nitrate contains much of the nitrogen you will need, so get a mix that will match up well with your NPK mix. CaNO3 should also be added to your nutrient reservoir by itself, rather than being mixed with the other two. If added together, the mixture will cause the magnesium sulfate to precipitate (i.e. it will become unavailable to plants). A dissolved oxygen level of 5 ppm is adequate and average for many hydroponic farmers. A level of 8 ppm is better, but difficult to achieve. Keep the water temperature in the 62–72º F range for the best DO potential. If the water gets too warm (about 70º F), the potential for DO lowers, and cold water results in poor plant health. pH: ideal levels are crop-dependent, but also heavily influence the availability of nutrients in the solution. EC: ideal levels are also crop-dependent. This depends on how much nutrient is in your solution already. It will raise and lower as crops take up nutrients, and as you add mixes to the solution. You will occasionally need to supplement your hydroponic system. Consult the Nutrient Deficiency Key to diagnose and treat your system with the appropriate supplements. Chelated iron. This is a biggie. You will almost certainly need to supplement iron, especially with crops like kale or basil (which may need it weekly). Epsom salts (the MgSO4 mentioned earlier) are a safe and quick way to boost magnesium. Use 1 dry ounce for every 1000–1500 gallons of water. Add it to the sump tank. To raise and lower pH use a store bought pH up or down. One gallon of each of these should last quite a while. To raise EC add nutrients. Do this very slowly and in small amounts. You can always add more, but it is much more difficult to deal with an “overdose” problem. There are some plants that do better in hydroponics than others. Root crops, for example, are pretty difficult to grow hydroponically because of the use of non-soil media which doesn’t usually provide as much space for the crop to grow in its normal shape. Check out the Best Crops for Hydroponics on Upstart University. This will provide you with the details you’ll need to know about growing each type of crop. Sanitize your system and components daily. Sterilize your system and components between crop cycles. This includes sterilizing your media—remove roots and kill all microbial life before starting a new cycle. Allow rigid reusable media to dry before transplanting new seedlings—leftover chemicals could kill them. Food-grade peroxide is food-safe as long as it is diluted correctly (32:1 water to peroxide). Using UV & ozone to sterilize can constantly kill biological material in your system. Use on solution between reservoir and plants. Clean filters regularly—they can become clogged. Check pumps and emitters—these lose efficiency over time. Blow out supply and drain lines frequently (every few days or so depending on your system). Do a visual check every time you enter your farm. Limit light exposure to any nutrient solution (cover your reservoir, use evaporation caps, etc. ), which will help limit the growth of algae and lower labor costs. Watch this video about cleaning your system to ensure you’re doing it correctly! Don’t mix CaNO3 with MgSO4 and NPK. It will react with the magnesium sulfate and create precipitates, which are not plant-available. MgSO4 and NPK may, however, be mixed together before adding to your reservoir. Don’t add iron while the UV is running. This will also create precipitates. Turn off the UV while supplementing with chelated iron, and then turn it back on once the system has cycled. Don’t sterilize your plants. They’ll die. Don’t use bleach on your plants or in the reservoir. The plants will die. Do not use lemon juice! There are two schools of thought on this: one is time-based and the other is volume-based. Nutrient changeover, also known as a reservoir flush, should be done on a regular basis. It is when you completely drain your system and refill it with fresh water and nutrient mix. Whether you decide to do it by time or by volume is up to you. This is a scheduled changeover. It looks something like draining your system every two weeks (small systems) to one month (larger systems), refilling it, and redosing it. We recommend doing it this way. This is changing over your cycle based on how many nutrients have been used up. For example, if you had a 100-gallon tank, by the time you’ve used half of the whole thing, you should dump the rest and refill it. Most people top off their tanks when nutrients are taken up by the plant. In this case, you would have to keep track of the amount of water you use every time you top off your tank. Once the top-off amount adds up to 50 gallons, it’s time to flush. Top off your reservoir with water first. Test your EC and pH. This should be done at least daily. Mix nutrients at the correct dilutions. Remember to mix CaNO3 separately. Add nutrients to the reservoir. Subscribe to the Upstart University Update newsletter to find out when you can download and print the PDF. Iron in Aquaponics—while this discusses iron’s role in aquaponics, the function of the nutrient in the system is very similar to hydroponics. This blog post will help you decide which chelated iron supplement you should use. How do you find a location to start a farm? How big of a space is required? That all depends on what type of farm you’d like to start. We’ve got a few great resources to help you work through that! 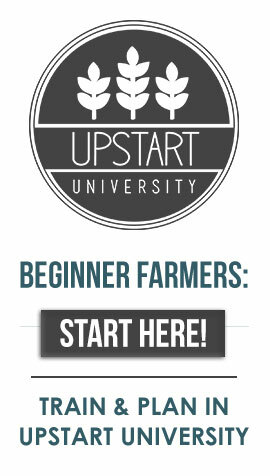 Check out the Ultimate Guide to Starting a Farm and enroll in the Upstart University courses. Good luck! “Food safe” is meaningless, what we should be concerned about is the phytotoxicity of a given oxidixzing agent in different crops. Simplified information is good, but it can be easy to go too far. I use bleach in reservoirs and love it, at a hobbyist scale, but food grade hydrogen peroxide could easily be argued to be a more effecacious oxidizer for pathogen control in commercial systems.